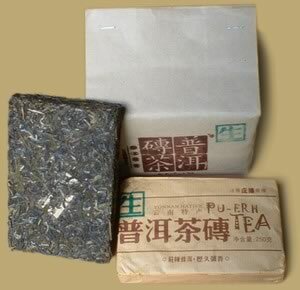 Founded in 1995, Tianpin Tea Company mainly engaged in the business of Pu-erh Tea and packed teas. Like all raw pu-erh, the tea can be drank now and enjoyed by those who appreciate the fresh, bitter, and sweet tastes experienced throughout 10-20 infusions, or put away for further aging. Weighs about 250 grams each, wrapped in a plain brown wrapper, four bricks pack.